Not too bad, right? My favorite part about this wreath is the color scheme. It says fall, but the cranberry color of the apples not only ties in well with the maroon of our door (and shutters) but will keep this wreath looking seasonal well past Thanksgiving, buying some time before the season calls for something more wintery. As an added bonus, the browns in the pinecones and eucalyptus help tie-in the brown of any bare spots where the wreath shows through, making that look intentional, not sloppy. Wink. My wreath wasn't perfectly round, so the most lopsided edge became my starting point. The fullness of the roses rounded that part out so it's not really noticeable anymore. As suggested in the tutorial, I was mostly able to weave the wire stems of the flowers into the vines to secure them. But for things that "stick out" like the eucalyptus and pinecones, I used wire to tie them down so they would lay where I wanted them. For hanging the wreath, magnetic wreath hangers were useless; they slid down or popped off immediately. Double paned leaded glass might have something to do with that. Since our door is painted, I didn't want to use a metal hanger that could damage the paint as it rubbed. Amazon Prime came through with this intense suction cup, and though I was skeptical, it's worked like a dream. 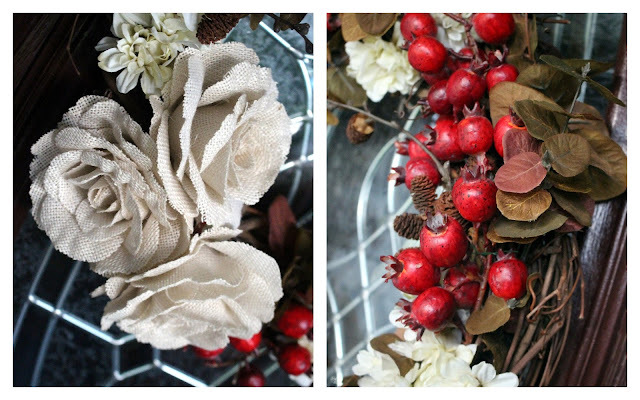 So there you have it, a naptime-sized project of a DIY wreath. Yes I would love one! My front door is calypso blue-teal. I think we should have a handmade theme for the gift exchange and you should pick me.